In its unprecedented effort to open up consumer lending, the Fed will be plagued by the over-leveraged consumer. Banks, unless absolutely forced to do so, will not lend to clients who are too leveraged. Unfortunately that happens to be a big part of the US consumers. * The period of 2003 - 2007 saw US household debt nearly double to $13.8 trillion. * During the same period household debt-to-income ratio has grown as much as it has in the previous 25 years. * Since 2003 home equity loans and cash-out refinancings provided consumers with $2.3 trillion of financing. This was everyone's personal cash machine. * Prior to the financial crisis, personal savings rate as a percentage of disposable income has fallen to nearly zero - the lowest since 1947. 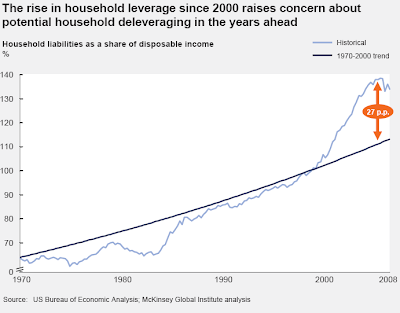 * In 2008 household net worth relative to income has fallen to the mid-1990s level and household net borrowings turned negative (first time in the postwar period). De-leveraging has begun. * We may need to see the consumer delever by another 27% before we get back to trend. Consumer delevering is not limited to real estate based credit. It also applies to credit cards, auto loans, etc. Here is data from the Fed on non-real estate consumer credit.